It is seven years since we had weather as severe as last week. 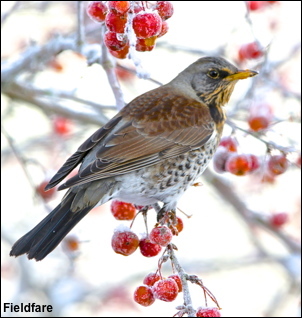 Deep snow and severe frost can make some normally wary birds more approachable and one of those species is the Fieldfare. A phone call from a good friend in Cheshire to say that he had many Fieldfares in his garden, eating crab apples, had me travelling down there the next day. It was to prove to be one of the most magical winter’s day filming that I have ever had.